Either I choose OK or CANCEL, it's still continue poping-up. Is it bug, or issue of my steam? Me too!What can i do? 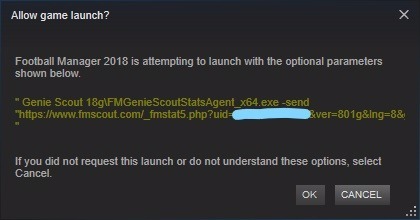 Any chance you guys installed Genie Scout 18g inside FM18 installation folder? That's the only reason I can think of. It's always best to install Genie Scout outside the Program Files folders to avoid any sort of conflicts like that. Stam's suspicion was right and following his suggestion fixed this issue for me, uninstalled scout and installed it outside of FM18 folder, thank you again Stam, best wishes. We will fix the issue in the next beta. For now, please avoid installing GS into FM folder. You are reading "GS18g bug: Allow game launch".